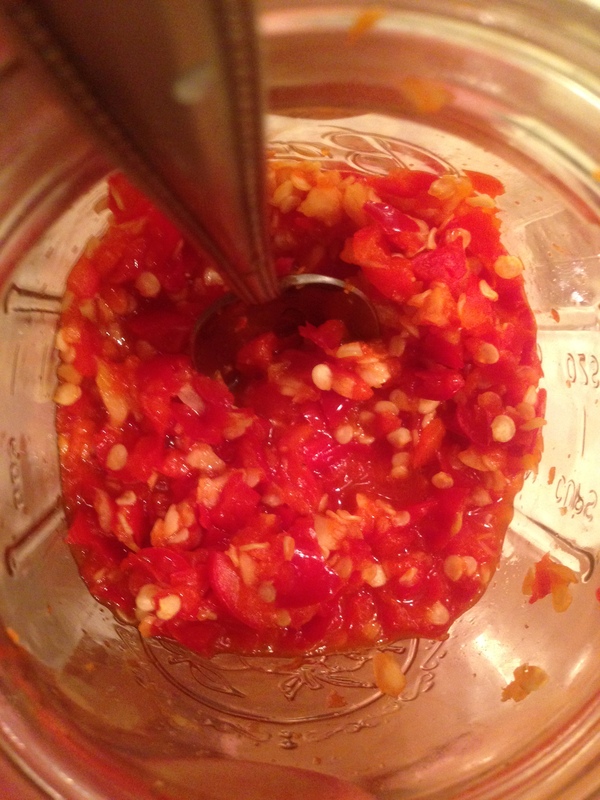 Making a homemade version of the popular sriracha hot sauce couldn’t be any easier : a simple fermented version can be made that is far more flavorful than any commercially available one. You could also make this sauce fresh, simply omitting the fermentation stage, but I think you will find that the extra time really adds a strong depth of flavor not present in the fresh version. For such a simple preparation, this sauce has a zesty, complex taste that far outstrips the somewhat one-note heat of Huy Fong and other store-bought brands. 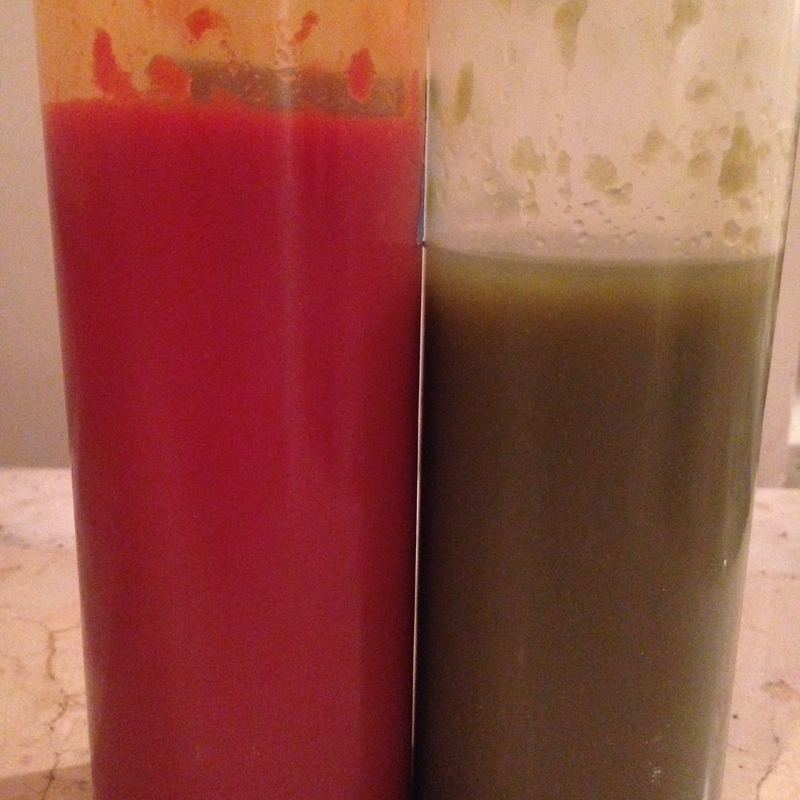 I like to make two versions of this sauce : one red, one green. They have quite different characteristics from each other, the red one possessing a much deeper, more complex heat and the green one a sharp, fresh heat. Neither is really superior to the other, and both are worth trying. I use the green one more often with salads and raw preparations, the red in soups and hot noodle dishes. Both are outstanding in cold noodle bowls, with the green getting the nod if I am using a lot of raw vegetables and herbs and the red if the majority of accompaniments are pickled or preserved. Fish? Green. Pork? Red. Tofu dishes? Both harmonize quite capably. First, you will need to choose appropriate chiles. I would avoid extremely fire-y chiles like Thai bird or habanero chiles, as they tend to be somewhat overpowering in a sriracha. Remember, this sauce is almost entirely chiles with only a smattering of other seasonings. What is wanted here is a deep, resonant, complex heat, not a pain-inducing power sauce. 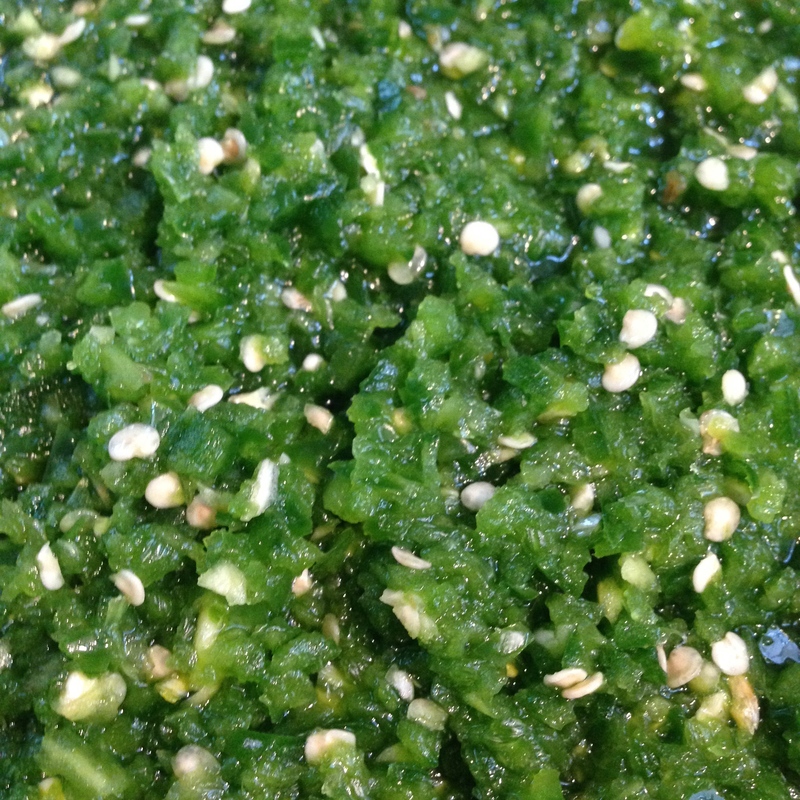 For a green sauce, jalapenos are completely appropriate. 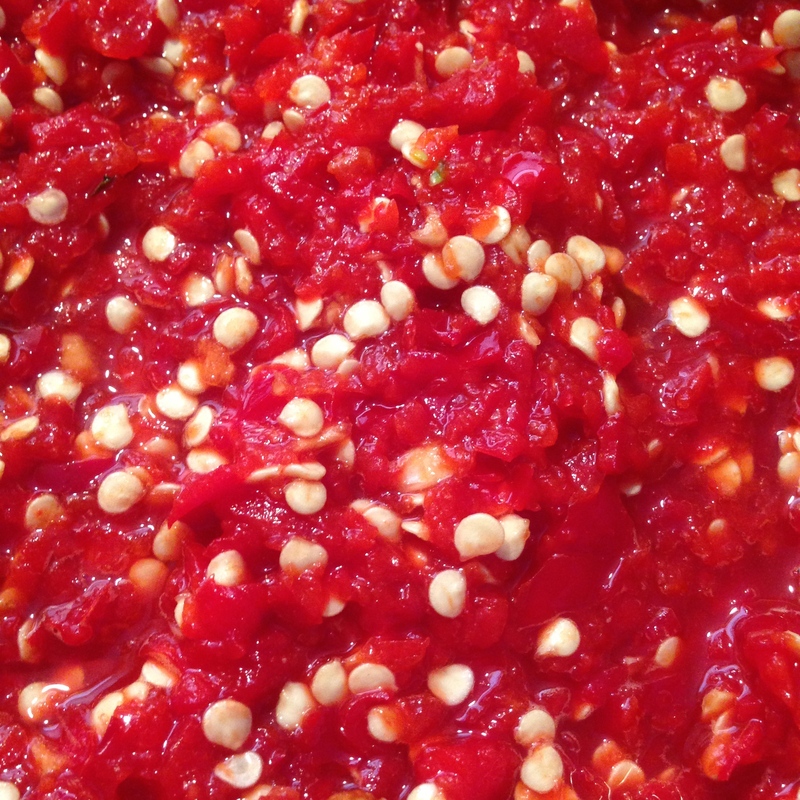 With red, look for either fresno chiles (sometimes erroneously called red jalapenos) or hot red cherry peppers. Cherries are my favorite, they have a perfect balance of hot and sweet that shines in both this sauce and the related chile-garlic sauce known as tuong ot toi. In fact, I have grown these chiles in the past couple of years explicitly for the purpose of making these particular sauces. You will want to experiment with this recipe, using the chiles you can grow or buy locally and that suit your particular taste. My only word of advice would be to avoid being overly macho the first time you make this. Use jalapenos or medium-heat red chiles and see how you like it before stepping up the heat. Pulse until well-chopped but not liquified. Place into a glass or plastic container, cover with a towel and allow to sit at room temperature for several days. Bring to a low simmer and cook for five minutes or so. Puree in a blender or food processor. If the mixture seems to thick add a spoonful or two of water, but be conservative. Strain through a wire mesh sieve into a squeeze bottle or jar. Use with, on and in everything. N.B. : You may find that you have quite a lot of seeds and pulp that will not fit through the strainer. I strongly encourage you to make a fermented salsa or sambal from this remainder, you will not find that it lacks heat or flavor.